Anyone who travels California's byways sees the many faces of agriculture. A huge entwined business, farming and ranching are the state's dominant land use. Yet few Californians understand what animals and crops are raised or how agriculture reflects our relationship with nature. This fascinating and gorgeously illustrated field guide gathers essential information about agriculture and its environmental context, and answers the perennial question posed by California travelers: “What is that, and why is it growing here?” Paul F. Starrs's lively text explores the full range of the state's agriculture, deftly balancing agribusiness triumphalism with the pride of boutique producers, sketching meanwhile the darker shadows that can envelop California farming. 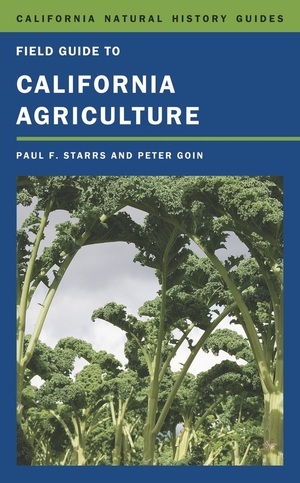 Documented with diverse maps and Peter Goin's insightful photographs, A Field Guide to California Agriculture captures the industry's energy and ingenuity and its wildly diverse iconography, from the mysteries of forbidden crops (like marijuana) to the majesties of scale in food production. Paul F. Starrs is Professor of Geography at the University of Nevada at Reno. He is the author of Let the Cowboy Ride: Cattle Ranching in the American West and (with Peter Goin) Black Rock. Peter Goin is Professor of Art the University of Nevada at Reno. His many books include Humanature, Changing Mines in America, and Nuclear Landscapes. "This book brings to life one of the most creative (and necessary) human endeavors and makes understandable the incredible complexity of California agriculture, one of the world's most daring experiments in feeding itself. A valuable resource that should be read by everyone—not just those of us who farm, but all of us who depend on farms. "—Michael Ableman, farmer, photographer, and author of From the Good Earth, On Good Land, and Fields of Plenty.